(Newser) – "Bluetooth" may strike you as an entirely modern word, but it's one found in the pages of history by way of Danish king Harald Gormsson, or "Harry Bluetooth", as he was known—and treasure connected to him has reportedly just been found. The Guardian reports 13-year-old Luca Malaschnitschenko and an amateur archaeologist were searching a German island with metal detectors in January when they came upon what turned out to be a silver piece. That spurred a larger dig involving experts, who over the weekend covered 4,300 square feet on Rügen island and turned up jewelry, pearls, a Thor's hammer, and coins, some of which date to Bluetooth's time; he ruled for just shy of 30 years beginning in roughly AD 958. 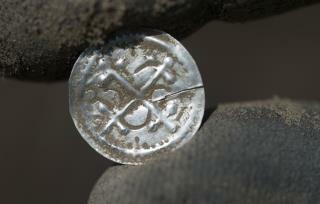 The lead archaeologist calls it "the biggest single discovery of Bluetooth coins in the southern Baltic Sea region." That is so awesome. Lucky boy to discover such a find. I hope he was allowed to participate in this dig.